The CMD, KIOCL, Shri Malay Chatterjee and the CMD, MECL, Dr. Gopal Dhawan signed an MoU in the presence of the Union Minister for Mines and Steel, Shri Narendra Singh Tomar, in Bengaluru, Karnataka on July 07, 2015. The Minister of State for Mines and Steel, Shri Vishnu Deo Sai and the Secretary, Ministry of Steel, Shri Rakesh Singh are also seen. The Meeting of the Parliamentary Consultative Committee Attached to the Ministry of Steel and Mines was held under the Chairmanship of the Union Minister of Steel and Mines Shri Narendra Singh Tomar in Bengaluru, Karnataka on 7th July 2015. Welcoming the members of the Consultative Committee on Ministry of Steel and Mines, in the garden city of Bengaluru to discuss on the R&D in Indian Steel sector and Enhancing Exploration, Shri Tomar said, so far India was the 4th largest steel producer in the world only after China, Japan and the US. However, during the first five months of this calendar year, India has achieved the 3rd position in the global steel production. He elaborated that Indian steel industry is growing at a reasonably good pace and last year the growth in crude steel production in India is more than 8%. However, per capita steel consumption is quite low, 60 Kg as against the world average of 216 kg. The low consumption no doubt indicates huge growth potential for Indian steel industry. India has fixed a target of 300 million tonnes production capacity by 2025 and steel ministry is working out action plan and strategies to achieve this target, he informed the members. Shri Tomar further said, Indian steel industry is already in expansion mode. The older steel plants are being modernized and expended. New green field plants are also coming with state of the art technologies. He told the members that very recently the Prime Minister dedicated the India’s largest Blast Furnace of 4160 Cubic Meter, installed at IISCO Steel plant at Burnpur and several Blast Furnaces of around 4000 Cubic Meter with world class efficiency parameters are in the operation in the country. On Research and Development to sustain the long term growth of the Indian steel industry, he said the problems in raw material area need to be addressed to utilize low grade ore and high ash coal through R&D and technology interventions. He stressed the need to pursue R&D for development of value added products for which we are dependent on import. Secondary steel sector is also requiring R&D interventions, he said. “We have also issued an advisory to all the large steel companies to step up R&D and enhance R&D investment up to 1% of their sales turnover. SAIL has corporate R&D center at Ranchi. RINL is also expending R&D infrastructure. Large private sector companies have also setup good R&D facilities for addressing their problems,” the Minister informed the members. ‘Ministry of Steel is facilitating for setting up of a new institution SRTMI and is contributing 50% in the corpus of SRTMI to spear head R&D of national importance. In-principle approval for setting up of SRTMI has been given and CEOs of major Indian Steel Companies have signed a Memorandum of Agreement with Ministry of Steel for participation and financial contribution in the initiative with an initial corpus of Rs 200 crore. Indian iron and steel industry will meet the set target of steel production of 300 million tonne by 2025 by developing new path breaking technology and using of Indian raw materials through R&D at pilot/ demonstration scale’, Shri Tomar explained. Addressing the meeting of the Consultative Committee of the Ministry of Steel and Mines to discuss Research and Development in iron and steel sector in India, Shri Rakesh Singh Secretary Steel said the ministry is facilitating growth and development of steel industry through various policy measures. The Ministry of Steel has fixed a target to increase steel production capacity to 300 million tonne by 2025. The target is no doubt is very ambitious and Ministry of Steel is taking follow up action in this regards. Several plants have already been expanded and SAIL is in the process of modernizing and expending its capacity from the present level of 12.8 million Tonne to 21.4 million tonne. He informed that R&D scenario in steel sector is improving. More dedicated Research and Technology Development programs would however, be required and we are targeting that the steel companies must spend 1% of their sales turnover on R&D to amply and meet the requirements of make in India program through zero defect and zero effect. The Secretary Mines Shri Balvender Kumar informed the members that the Mines and Minerals (Development and Regulation) (Amendment) Act, 2015 became necessary to address the emergent problems in the mining industry. The Amendment removes discretion in the grant of mineral concessions. All mineral concessions are granted by the respective State Governments now through auctions, thereby bringing in greater transparency and removing discretion. This should also mean that the Government will get an increased share from the mining sector. He said, the Amendment Act 2015 makes it mandatory to establish a District Mineral Foundation (DMF) in all districts where mining takes place. Contribution to the DMF of an amount not exceeding one-third of the royalty rate in so far as new concessions to be granted by auction are concerned and not exceeding the royalty in respect of existing concessions has been provided for. Talking about exploration, Shri Balvender Kumar said, Indian mining industry has not seen the type of exploration as in other countries. To address this, the Amendment Act has provided for a National Mineral Exploration Trust created out of contribution from the mining lease holders. This would allow the Government to have a dedicated fund for undertaking exploration. National Mineral Exploration Trust is being set up for providing impetus to exploration in mining sector. In addition, the transferability provision (in respect of Mining Leases to be granted through auction) would permit flow of greater investment to the sector and increasing efficiency in mining. On Stringent provisions against illegal mining, he said, all offences under the Act will now be subject to a maximum punishment of 5 years imprisonment or fine of Rs. 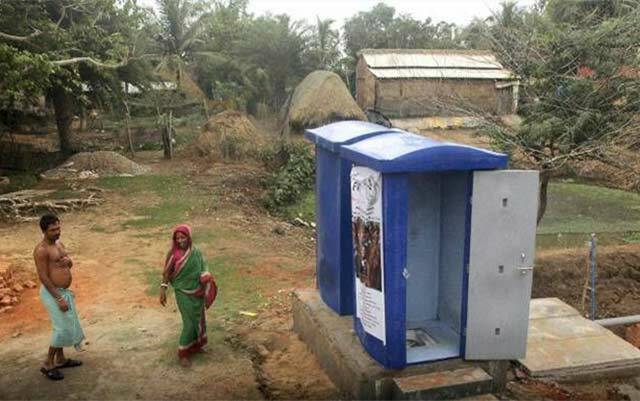 5.00 lakhs per hectare. Shri Vishnu Deo Sai, Minister of State in the Ministry Of Steel and Mines was also present in the meeting. • India is the 4th largest steel producer with Production: 88.25 MT in 2014-15. • In the first 5 months of 2015, India has become the 3rd largest steel producer. • India is on track to emerge as the 2nd largest steel producer soon. • Per Capita steel consumption in India is about 60 kg against world average of 216 kg. Justifies higher growth potential. • India has set target of production capacity of 300 MT by year 2025. • Enhanced R&D investments & adoption of new technologies are imperative for competitiveness of Indian steel industry. 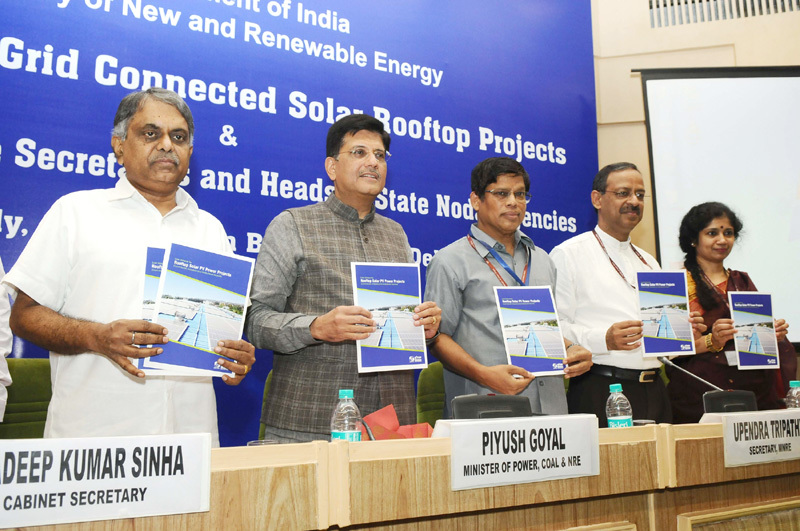 The Minister of State (Independent Charge) for Power, Coal and New and Renewable Energy, Shri Piyush Goyal launching the Rooftop Solar PV Power Projects, at the Workshop on Rooftop Solar Projects, in New Delhi on July 07, 2015. The Cabinet Secretary, Shri Pradeep Kumar Sinha, the Secretary, Ministry of New & Renewable Energy (MNRE), Shri Upendra Tripathy and the Secretary, Ministry of Coal, Shri Anil Swarup are also seen. Shri Piyush Goyal , Union Minister of State (IC) for Coal, Power and New and Renewable Energy has said that the target of generating 1,75,000 MW of Renewable energy ( RE) by 2022 should be taken as a mission for ensuring energy security of the country. 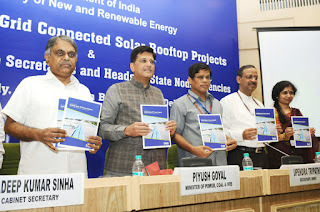 While addressing the workshop on Grid Connected Solar Rooftop at Vigyan Bhawan today, Shri Goyal further said that Government of India is soliciting ideas and constructive criticism on all the renewable power projects and no amount of negative response can deter Ministry from its dream of achieving this target. India will soon lead the league of pioneer countries of the world in the field of renewable energy. The Minister assured all participants that the intricacies of each and every Renewable energy plan is well thought of in advance for achieving energy security for the nation. The Minister also launched IREDA’s loan scheme for Rooftop Solar PV Power Projects on the occasion. The scheme will provide loans at the interest rate of 9.9 to 10.75 % to the system aggregators and the developers. Speaking on the occasion, Shri Pradeep Kumar Sinha, Cabinet Secretary said that India has great potential for solar rooftop projects which has not been exploited fully at present. He informed that Government of India has set a target of 100,000 MW grid connected Solar Power in the country and out of this 40,000 MW has to come from Solar Rooftop systems. To achieve this, Shri Sinha said “We need policy & regulatory interventions. Both Ministries of Power and New and Renewable Energy are working together in these directions. He further added that state regulators have to fix the tariff for RE power which goes to grid. This is important factor in popularising RE programme , Shri Sinha added. Elaborating the several steps being taken by Power Ministry to promote RE , Shri Sinha stated that amendments in the Electricity Act to introduce Renewable Generation obligation is proposed along with raising of Renewable Power Obligation in the tariff policy. In additions, stringent penalties for violations are being proposed. Highlighting importance of evacuation of RE power, Shri Sinha suggested to the States to socialised cost of transmission within State to improve renewable capacity. In his welcome address, Shri Upendra Tripathy , Secretary MNRE called upon the States/ Ministries /Departments to become partner in transition from Megawatts to Gigawatts . He said target of 175GW of Renewable Energy by 2022 which principally comprise 100GW of solar and out of this 40GW through Rooftop is very challenging and to achieve this needs everyone help. Highlighting the need of more capital required in RE sector , Shri Tripathy said that Ministry has got fund of Rs 5000 crore for rooftop which can be given in the form of interest subvention or 15 percent interest subsidy. He further stated that Ministry is also trying to get 2 billion dollars from World Bank and ADB towards rooftop projects which can be passed on to the banks to enable them to finance the projects on soft rates of interest to the agencies. Shri Tripathy also stated that the Ministry has got commitment of 1 million Euros from kfw and further negotiating with different agencies to get more capital for RE sector. He further told that according to small survey held by the Ministry, projects worth 1500 MW capacity can be placed on rooftops of government departments. It was emphasized in the workshop that the Distribution Companies should implement regulations relating to net-metering/feed-in-tariff, grid connectivity and the metering arrangements and develop suitable and simple mechanism to promote the solar rooftops in the country. MNRE has provided the financial assistance of Rs. 1 crore to each Ministry of the Government of India to install minimum 1 MW solar plants on their roofs/lands and also in their associated Institutions. Some success cases, including Chandigarh Solar City and Delhi Metro Rail Corporation (DMRC), were presented in the workshop. A review of Government of India’s Solar Energy Programmes and sessions on other renewable energy technologies and programmes, including Small Hydro Power, Biomass Power, Bagasse Cogeneration, SADP, Wind Power, RPOs/RECs, Improved Cook Stoves, HRD, Biogas and Biofuels was also undertaken by the Ministry. The Secretaries and other officials of Government of India including DMRC and the State Governments participated in the Workshop. The Union Minister of State (Independent Charge) for Development of North Eastern Region (DoNER), MoS PMO, Personnel, Public Grievances,Pensions, Atomic Energy and Space, Dr. Jitendra Singh said that India is a “happening" place today and soon, under the visionary leadership of Prime Minister, Shri Narendra Modi, India is destined to become a trendsetter in global economy. He was addressing the Cost and Management Accountancy (CMA) Awards function organized by the Institute of Cost Accountants of India (ICAI), here today. Congratulating the young achievers and award winners in the field of Cost and Management Accountancy, Dr. Jitendra Singh said, “you deserve kudos because you have made it on your own and in the years to come, you have an important role to play because India is progressing by rapid strides and the role of cost and management accountancy is bound to increase manifold". “You form the backbone of not only Indian economy but that of the 21st century India”, said Dr. Jitendra Singh and added that this is what makes all the difference and also makes everyone’s role much larger and crucial than ever before. 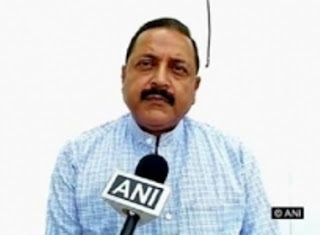 Referring to the rise in Growth rate, Dr. Jitendra Singh said, even though during the last one year after the Modi Government took over, the Growth rate has shown a constant steady rise, but our target is to achieve a double-digit Growth rate for which you can also contribute by suggesting the suitable pricing mechanism. Referring to various innovative schemes launched by the Modi Government, he said, pro-poor schemes like "Jan-Dhan Yojana" and "Atal Pension Yojana" are in fact not only a means of productivity and the economic security but these also bridge economic and psychological gap among various sections of India's heterogeneous society. Emphasising that India is presently going through one of the best times, Dr. Jitendra Singh said that greatest advantage for the Indian economy today is that the present political establishment is favourably inclined. On behalf of the Government, he assured that under Prime Minister, Shri Narendra Modi, we are committed to provide an environment which is conducive to the promotion of economy. In his capacity as Minister for Northeast, Dr. Jitendra Singh called upon the business community to invest in Northeast to accomplish the dream of making Northeast a part of larger dream of “Make in India”. Dr. A.S. Durga Prasad, President of the ICAI, Shri P.V. Bhattad, Vice President, ICAI and other senior officers are present on the occasion. Under the use of Solar Energy Programme in Indian Railways, Two Railway Stations in Rajasthan Namely Aburoad and Bhilwara Station to be Illuminated with Solar Energy. Indian Railways continues to take steps for increased use of environment friendly solar energy to supplement its energy needs. Under this programme, an important initiative has been taken today i.e. on 7.7.2015 by Ajmer Division of North Western Railway to illuminate its two Railway Stations namely ABUROAD & BHILWARA stations in Rajasthan with solar energy. In this connection Ajmer Division Railway office has signed an MOU with a Railway PSU namely CONCOR to set up the solar plant at Aburoad and Bhilwara station under CSR (corporate social responsibility). The MOU has been signed between the two organizations today i.e. on 7.7.15 at Delhi in the presence of Shri Naresh Salecha, DRM Ajmer Division and Board of Directors CONCOR. Officers of Railways & CONCOR were present on the occasion. The funding of the solar project will be done by CONCOR under CSR (Corporate social responsibility) programme & solar plant will be set up by Ajmer Division. CONCOR will provide approx. 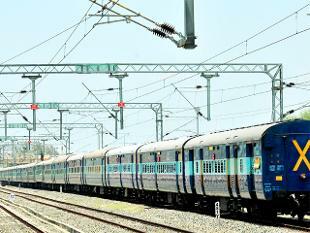 Rs 100 lacs to Railway to set up the solar plant on both stations. It is the result of special efforts made by DRM Shri Naresh Salecha. Solar plants have already been installed & working at AJMER & UDAIPUR stations of Ajmer Division. In this project, Railway will set up 40 KWP solar plant at Aburoad station and 40 KWP solar plants at Bhilwara station. The Solar plant will be maintained for 5 years under warranty scheme. The energy generated from it will provide continuous power supply to Railway platforms and the offices situated at the stations. After set up, the solar plant will not only ensure energy conservation, but will also help to keep the environment pollution free. The solar plant at both stations will produce 1, 50,000 units per year & railway will save Rs. 10, 50,000 per year. The codal life/estimated life of this project is 25 years. In this way Railways will save Rs. 2.5 cr. or more. Passengers of Aburoad and Bhilwara railway stations will be benefitted by this project. The Union Minister for Social Justice and Empowerment, Shri Thaawar Chand Gehlot distributing the aids and assistive devices for disabled persons under the ADIP scheme, at a distribution camp, in Dharwad district of Karnataka on July 07, 2015. Shri Pralhad Joshi, Member of Parliament, Dharwad constituency is also seen. Union Minister of Social Justice and Empowerment Shri Thaawar Chand Gehlot inaugurated a camp for free of cost distribution of Assistive Aids and Appliances under the ADIP scheme of Government of India held at Shri Mallikarjun Mansour Kalabhavan, Dharwad in Karnataka today. While addressing the gathering at a mega distribution camp Shri Gehlot said that persons with disabilities are highly talented and are integral part of human resource. Minister committed to develop a Sports Center for person with disability in Hubblli –Dharwad if adequate land is provided by state authority. 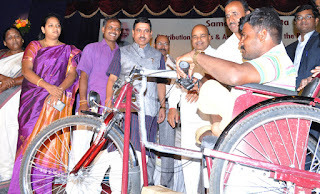 Further he reminded that it is the social responsibility of one and all to support and encourage differently abled in order to create an appropriate environment to empower them and bring them in the main stream of the society. The Camp organized by Artificial Limbs Manufacturing Corporation of India (ALIMCO), Kanpur working under the aegis of Department of Empowerment of Person with Disability, Ministry of Social Justice and Empowerment, Government of India in close association with District Administration, Dharwad. Shri Pralhad Joshi, Member of Parliament, Dharwad applauded the efforts made by the ministry for conducting the camp in his constituency. He said that the camp not only benefited the needy but also created an awareness about various welfare schemes run by government for persons with disability. Shri Lov Verma, Secretary, Department of Empowerment of Persons with Disability, Ministry of Social Justice and Empowerment spoke about the achievements and informed everyone about the various welfare schemes implemented by the department for the Persons with disabilities. A total of 1004 Persons with different kind of disabilities were provided 2502 numbers of aids and assistive devices manufactured and distributed by ALIMCO worth Rs. 1 Core 32 Thousand under the ADIP scheme in the camp. These beneficiaries were pre identified during the assessment camps conducted last year on 14th to 17th Nov, 2014. Modern contemporary Aids and Assistive devices were distributed in the camp which includes 05-Daisy Players, 05-Smart Canes & 05-Tablets for Visually Impaired 05-ADL Kits (includes cell phone) for persons affected from Leprosy and Motorized Tricycle. Total 26 numbers of Motorized Tricycle distributed in the camp were provided to the identified beneficiaries affected from 80% or more than 80% of disability.¬¬ Among various other assistive aids and devices provided in the camp were 129-Tricycles, 76-Wheelchairs, 190-Crutches (Axilla and L-bow), 54-Walking Stick, 30-Rollators for Orthopedically Impaired persons 61-Braille Cane(folding) & Braille Slate, 01-Cervical Collar, 842-Behind The Ear – Digital Hearing Aid machines and 108- MSIED Kit (Multi Sensory Inclusive Educational Kit) for Children with Special Needs. Also in the camp 115 beneficiaries were facilitated with 123 numbers of Prosthetics and Orthotics appliances. Shri Arvind C. Bellad, MLA, Dharwad (West), Shri P. Rajendra Cholan, District Commissioner, Dharwad, Shri D R Sarin, CMD, ALIMCO, Local representative, dignitaries and senior officers from district administration and ALIMCO were present during the function.